Home / Nigeria police / Police Recruitment / How to Successfully Apply for Nigeria police force Recruitment exercise. How to Successfully Apply for Nigeria police force Recruitment exercise. The Perfect time to apply for Nigeria police force recruitment is at midnight or early in the morning due to too much traffic on the Recruitment portal. 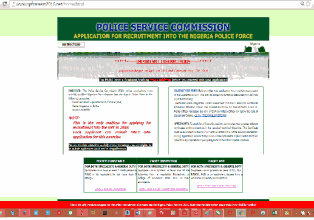 The NPF Recruitment Portal is now Officially Open as promise by the Service, and the official web portal for the online Registration as stated by the Service are: http://www.npf.gov.ng or http://www.psc.gov.ng but due to excessive traffic the portal is receiving, it has become difficult for applicants to access the portal. As of 2pm friday 1st April about 8000 applicant has already registered on the portal. The recruitment exercise is free and you can apply with ease through the link below if the two links above are not accessable: http://www.npfcareers2016.net the link will lead to this page.